Your September 4th article, “Navy: Withdraw the Army,” discusses the anti-drug trafficking recommendations made by Mexican military officials but then neglects to analyze the corresponding implications of what they called for. 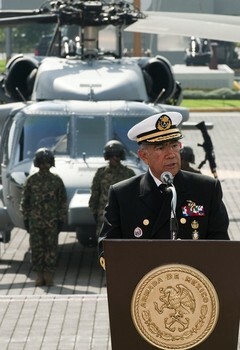 Mexican Naval Secretary Saynez warns against excessive use of army resources in the war on drugs, while making assurances that the Mexican Navy is less susceptible to corruption and well qualified for greater responsibility. However, the suggestion that the Navy could carry a significant part of the anti-drug burden is a flawed assumption of the use that available personnel should be put to and should be critically assessed for its logic. Furthermore, your article does not address the specific measures the Navy has taken up to now to prevent the infiltration of drug traffickers in the Navy. Oscar Narajo, the future security advisor to President-elect Enrique Peña-Nieto, has recommended the creation of elite military groups to fight drug traffickers and hired assassins. However, such groups could end up resembling the Zetas drug cartel. The Mexican government wasted money and resources to create the Zetas, now heralded as “the most technologically advanced, sophisticated and dangerous cartel operating in Mexico”. The same could happen again. The Mexican public needs to know what preventative measures Mexico’s military will now initiate to avoid the failed experiments of the past.